Grant discovered chiropractic after receiving chiropractic care for sport and work-related injuries. Inspired by the effective results he experienced, he studied at the Welsh Institute of Chiropractic, graduating with a distinction and awards for both Clinician and Graduate of the Year. 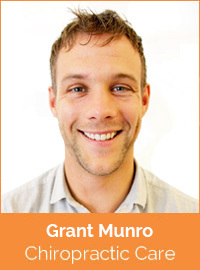 Since graduating, Grant has completed numerous courses focussing on finding and correcting a client’s primary cause for complaint using an integrated approach with muscle testing, utilising Functional Range Release™ soft tissue systems. He’s also working towards becoming an Internationally Certified Chiropractic Sports Practitioner, and is one of only a handful of chiropractors in the UK utilising the Structural Joint Balancing system. Outside of work Grant enjoys being outdoors, live music, Brazilian jiu-jitsu and playing golf.